Celebrating 60 Years of History! The company has come a long way from those early days, but one thing that remains strong is the entrepreneurial focus on innovation. In the early 1950's the United States was looking toward the future with all the energy and promise of the American dream. It was an exciting time to be alive and California was poised for economic growth the likes of which the world had never seen. Our seemingly unlimited manufacturing capacity had created an abundance of materials to supply a rapidly expanding nation. Amidst this swirl of national expansion and economic boom, the National Wire & Cable Corporation was established to supply wire to the growing electronics industry. In the years that followed, National Wire and Cable quickly evolved from a distributor of surplus wire and cable to the nation's foremost manufacturer of wire and cable products. Along the way a robust custom cable molding and assembly division was built with a variety of highly specialized niche manufacturing operations. National Wire & Cable today is a strong and reliable partner in America's growing high technology future. In many ways the company is driving that future with exceptional technology solutions in the fields of energy, natural resources, transportation, the environment, and the field of medical science. As an employee owned company (ESOP) the spirit of our founder, Harry Appleton, lives on in the achievements of National Wire and Cable's people. National Wire is helping to make all-electric vehicles a reality. This effort is part of the company's commitment to the environment and to become a major player in the electric vehicle market. 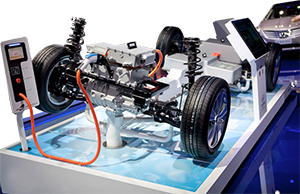 At the heart of this program is National Wire's specialized controller cable for the next generation of advanced fuel cell vehicles. Developing electronics for use in an automotive environment means making something that can hold up under prolonged stress, vibration, dirt, moisture, heat and chemicals. We were selected for this project because our engineering team understands rugged and dependable. We make ruggedized cables to withstand some of the harshest geophysical environments imaginable. We are one of the global leaders in the development of advanced geophysical cables. These sophisticated devices are helping scientists to explore and map the last frontier of planet earth, the oceans floor. Our under-sea cables are being used to locate new sources of energy, all without harming the environment. Advances in the field of medical technology have been nothing less than extraordinary. Magnetic resonance imaging is one fairly recent example that has quickly proven to save lives and has provided a major step forward in the early detection and prevention of a broad range of diseases. The integrity of signal transmitted over an MRI cable means the difference between success and failure. We are proud that our specialized MRI cables and integrally molded connectors are helping make this technology possible.